If you are an honest, law-abiding citizen, you can’t buy a sub-machine gunâ€”but if you’re a gangster you’ll have no trouble. The author tells here how the underworld carries on an amazing secret traffic in machine guns and other deadly weapons. FOUR men walked down a busy city street. Except that their right arms hung rather stiffly at their sides, their appearance would have attracted no attention anywhere. Yet each man was literally a walking arsenal. Under each well-tailored coat, a Thompson sub-machine gun nestled snugly against the bearer’s armpit. The muzzle, only slightly protruding beneath his coat, was concealed in the palm of his hand. Close behind them walked two othersâ€” musicians, apparently. But the innocent-looking violin cases they carried held more machine guns. Each carried a round black drum loaded with 100 45-calibre bullets. In an instant these six men could have transformed themselves into a formidable machine gun squad of terrible power. Such a miniature army might today enter your own town and open a reign of terror. An amazing secret traffic in machine guns has armed organized crime in military fashion. With revolvers and pistols for light arms, machine guns for artillery, armored automobiles for tanks, and tear gas for poison barrage, criminal mobs become more formidable than an army. All this is made possible by underworld channels which distribute the weapons for the sake of an enormous profit. How do gangsters obtain these terrific instruments of death? Where are they manufactured? How are they distributed and sold? Recently the writer undertook to learn these facts. He found the amazing truth to be that machine guns can be bought like so many sacks of potatoesâ€” if you are known in criminal circles and have the money. An honest citizen might find it difficult to get one â€” but not a known gangster! Here is an example of how the system works. A number of sub-machine guns, ordered in the name of the police department of a large city, were diverted by an unscrupulous official to a firearms company in which he had a financial interest. When detectives checked up, the dealer said that all records had been lost, and that he could tell them nothing. Police did not doubt that the guns had passed into the hands of criminals, but lack of legal proof tied their hands. 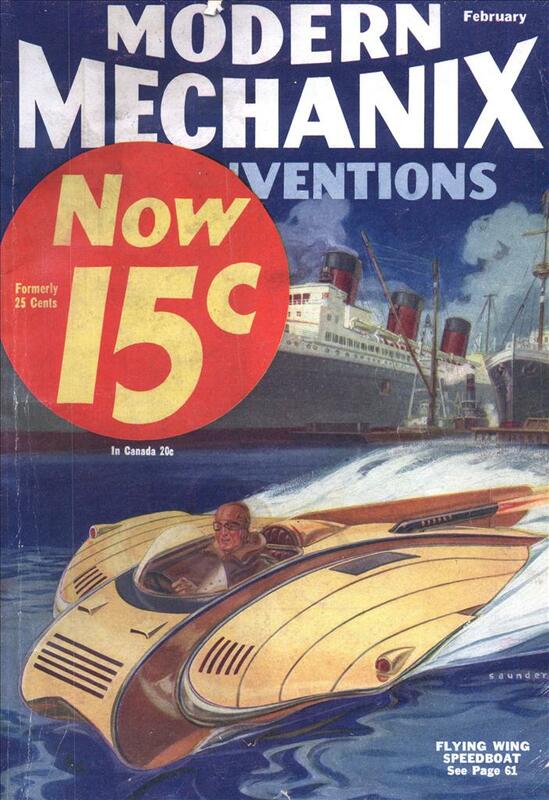 This episode was followed by a series of robberies in which machine guns were used. Soon afterwards, a carload of racketeers overtook an armored truck, opened a withering stream of machine gun bullets on the wheels, cut them out, and overturned the truck. When the crew foolishly came out to give battle, they were shot down and a large payroll stolen. Modern machine guns are of two types â€”the machine gun, and the sub-machine gun. The machine gun, proper, is a large weapon, weighing, complete, several hundred pounds and requiring a tripod mounting. Its ammunition is generally of .30 calibre, although .45 and .50-calibre guns are in use by the Army. The bullets are fired from belts or drums. The sub-machine gun is smaller, lighter, and requires no mounting. It is the principal weapon of the racketeer. Rapid-fire guns today are operated by the recoil of the barrel or the back-pressure of the powder gas. The Vickers, Browning, Maxim, and the Thompson submachine gun, are recoil – operated; the Browning auto-rifle, Hotchkiss, and Lewis machine guns are operated by gas pressure. Because of its large size and weight, the ordinary machine gun is used almost exclusively by military authorities. 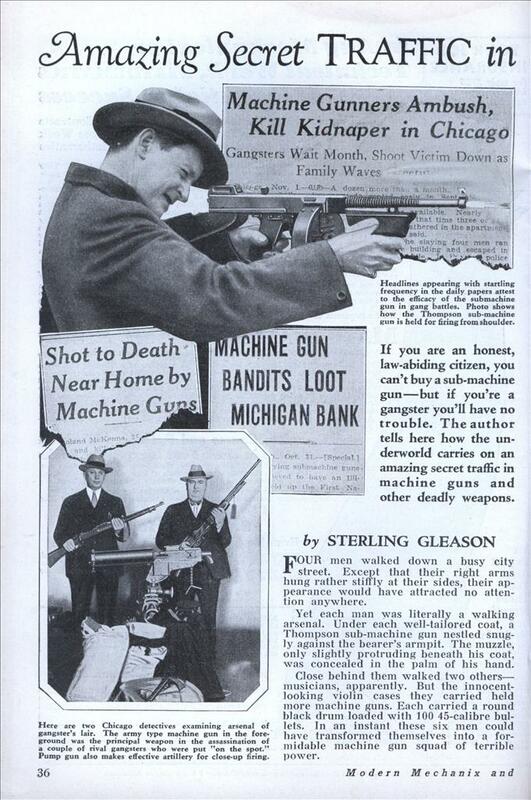 Gangsters prefer the Thompson sub-machine gun. If you study this weapon, you will realize what a terrifying thing it is, and understand its power. Short, stocky, light enough for one man to carry and use, it is in reality an automatic rifle which will pour out bullets at the terrific rate of 400 to 800 per minuteâ€”spitting them forth so fast that they are almost end to end. The ammunition is .45-calibreâ€”giving the gun greater “stopping power” than any other ordinary machine gun or rifle. The impact of these heavy slugs will inflict a terrible shock that stops the strongest man immediately. Traveling at from 850 to 900 feet per second, the .45 bullet carries a muzzle-energy of 430 foot-pounds. At 300-foot range, it will penetrate white pine to a depth of 5-1/2 inches. Not only the force its bullets deliver upon impact, but its rapidity of fire, makes the gun so deadly. A 100-round drum may be fired in less than fifteen seconds. Pump 100 lugs of lead, weighing more than three pounds all together, into the delicate parts of the human body, and you will put any man out of commission. Although a tremendous power in the hands of the gangster, the machine gun is useful to police chiefly as a threat. Ruthless gangsters have no objection to turning a machine gun loose on the street, shooting down women and children without compunction. Such an occurrence has taken place in New York City three times within the past six months. Policemen, however, will not fire into a crowd. Tear-gas is more effective and does not permanently injure. Only when a desperate criminal is barricaded in a house, for example, can the machine gun be used freely by police. “I have frequently used the sub-machine gun for personal protection,” said one detective lieutenant whose work brings him into constant contact with gangsters. “For this purpose, a Thompson gun, plus a tear-gas ‘fountain pen,’ is ideal. “Recently I had to bring in a big beer baron who had just come to town and was wanted by police. A known killer, he was always accompanied by a heavily-armed bodyguard. What a crock of sh*t! I see LE/Feds needed more training then, as they do NOW. The real criminals work for politicians, they will always have guns and want to commit violent crimes, only heavily-armed citizens deter criminals and dirty politicians.